Truth is stranger than fiction. It is also less palatable and less pliable than fiction. Truth, and by extension reasoning, was overshadowed by fiction, and by extension, emotions in two historic events this year – the referendum leading to Britain’s exit from the European Union, and the victory of Donald Trump – whose reverberations will continue for years to come. That is why Oxford Dictionaries named ‘post-truth’ the word of the year. In India, too, this phenomenon has been more pronounced in recent years and we have seen political claims and counterclaims increasingly veering from the facts. But then, do people always care about truth above all else? Weren’t we always in a post-truth world? Take the Dreyfus affair, for example. In 1894, Alfred Dreyfus, a French artillery officer, was convicted of treason. The evidence was thin and open to question (and it indeed was questioned, leading to his exoneration, albeit much later), but the media and public opinion had already decided the case: he was a Jew, so his loyalty to the republic was questionable. For years, as the celebrated case was discussed in parliaments, courts, saloons and dinner tables across Europe, his culpability was not taken as something to be proved, but as already proven by his religious identity. No amount of facts can convince those who do not need the facts to be convinced. How do you apply Hitchens’s Razor – Christopher Hitchens’s one-liner "That which can be asserted without evidence, can be dismissed without evidence" – if nobody is bothered about evidence? Jews were also at the receiving end of an elaborate hoax of a book called The Protocols of the Elders of Zion. It describes a Jewish conspiracy to control the world. And a majority in the West found sufficient ground to believe its contents even though it happened to be outright fabricated. Closer home, as senior journalist Shekhar Gupta noted in his Business Standard column on November 18, Indira Gandhi’s Garibi Hatao struck a chord with the poor for years, and she returned to power again and again, never mind the fact that the incidence of poverty had not gone down a bit at the end of her reign. George Orwell’s Nineteen Eighty-Four, with its newspeak and the ministry of truth, was not a futuristic fiction but a sort of perennial parable, describing what has been going on around the world more or less. In other words, it has always been 1984. Brexit and Trump did not make our world post-truth overnight. Like economics, political science is also a gradual learning that an individual is rarely a rational agent. An aam aadmi usually votes on the basis of prejudices, perceptions, cooked-up narratives, hearsay and beliefs right or wrong; and not after studying manifestos, reading editorials, checking self-declared affidavits and asking local candidates all the pertinent questions. Contrarians can find some room for debate between the terms ‘truth’ and ‘fact’. If literature allows you to lie to tell truths, so does politics. Maybe, a large number of statements made by Trump were factually incorrect, but he found resonance with people because he was, as in a work of literature, talking some larger truth, about the despair of the jobless and the hopeless economic situation. It might be the same underlying truth of the times that found its expression in the Brexit vote, never mind the completely false claims of Polish plumbers taking jobs away from Britons and Britain standing to gain an astronomical amount every week after quitting the EU. As part of the Gujarat assembly election campaign in 2012, Narendra Modi had repeatedly claimed that the UPA government had paid Rs 1,880 crore for Sonia Gandhi’s medical treatment abroad, and he cited in support a news agency report based on the PMO’s reply to an RTI query. As he went on to repeat the claim at election rallies later, at first the PMO rubbished the claim, next the RTI applicant did so, then the CIC and finally the agency too clarified. The clarifications were for the record, delegated to a small news item on the inside pages. The claim, on the other hand, spread to millions. That’s post-fact politics, yes; but it might be argued that he expressed the truth, or at least the perception, that during the UPA regime, the government was run by an extraconstitutional authority. If that was not the case, the questionable claim may not have gained traction among the masses. A degree of mendacity has always oiled the political discourse. This apparent falsity might even be seen as poetic licence revealing deeper truths. If so, reports of the death of truth are perhaps greatly exaggerated. They might be post-factual truths, and thus we needn’t worry too much about the world. Perhaps, this is the right place to introduce the other words of the year, chosen by other dictionaries based on the number of times the words were searched and some other parameters. They are supposed to reveal the trends of the times. At dictionary.com, the word of the year is xenophobia and at Merriam-Webster, the top candidate is fascism. 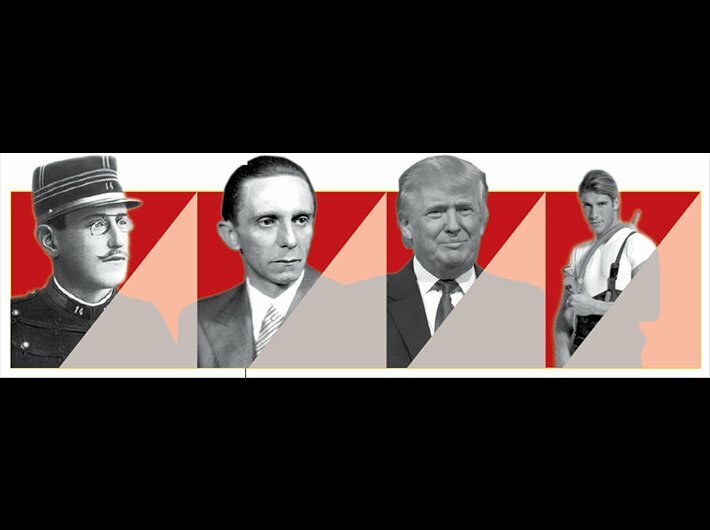 If we make semantic clouds of these three terms, add historical events like the Dreyfus affair, throw in a bit of Goebbels and Orwell, join the dots, and compare the trends of the early part of this century with the same time frame of the previous century, the future certainly looks scary. Common to both epochs is how economic distress and the unsavoury fruits of globalisation add to the fear of the other, providing fertile ground for bigots and demagogues who subvert truth and misuse the media to appeal to the gullible, secure power, and then wrest more and more power. The only difference between then and now – and this is why the post-truth phenomenon is far more chilling – is digital technology in the hands of millions, especially social media. Time was when people propagated news or rumours by citing the BBC. Now, nobody needs to cite anything while forwarding fake news of international awards going to their favourite political leader. Appeals to fact-check by citing the traditional media will elicit the response that it was always biased. Moreover, the norms of political discourse – what can be and cannot be discussed in public – are changed. Racial and social prejudices once remained confined to private conversations, and so-called political correctness prevailed in public sphere. But now, all views can be aired on WhatsApp and Twitter, with or without the guard of anonymity. Bringing Mahatma Gandhi in this debate may seem too obvious, but the first of his Ekadash Vrat, or eleven vows, was truth. (The second was non-violence.) The upanishadic phrase, Satyamev Jayate, or Truth Shall Prevail, is not something that is going to happen on its own; it needs work. The national motto is not given as a truth, but as a call to action.